These pillows are so squishy and fun to cuddle up with. 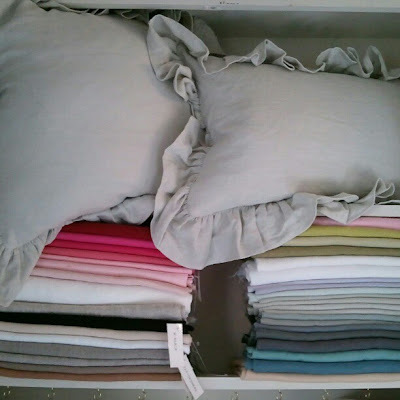 They feature a generous 4" long ruffle that is triple gathered around all four sides made of 100% pure linen. I've got many in stock that are ready to ship for that someone special on your gift list including white, rice paper, off white, and natural oatmeal colors. Prices start at $45 for the larger boudoir pillow size (fits a 15" x 22" insert). Can be shipped with or without a premium down and feather insert (add $10 for insert).